In the 1960s and 1970s, white evangelicals looked warily at the American city. The fear, flight, and disinvestment of this period involved not only questions of race, class, and economy. Urban decline was also a religious phenomenon. In some urban neighborhoods, white evangelical congregations liquidated their properties and moved everything – churches, schools, homes – to the suburbs. Evangelical higher education followed this trend. Some white evangelical colleges moved from city centers to new suburban locations, while others that stayed in the city adopted a besieged mentality. In a moment of violence and political upheaval, many white evangelicals viewed the city as a threatening place. But some white evangelicals believed the newfound visibility of urban problems and African American concerns required new approaches in evangelical higher education. While other fled the city, these white evangelicals would embrace it. In Philadelphia, Messiah College launched an urban satellite campus in an effort to engage these new realities the civil right movement had wrought. This campus received significant publicity in evangelical circles as a potential model for other evangelical colleges to follow. Drawing on a theology of colorblindness, some white evangelicals sought to create Christian academic communities that transcended racial problems and healed the nation’s cities. The successes and failures of these efforts revealed an evangelicalism unable to resolve the thorny tensions at the intersection of religion, race, and urban higher education. Jesse Curtis is a Ph.D. Candidate in the Department of History at Temple University. He holds an M.A. Degree from Kent State University. His dissertation explores the emergence of colorblind theologies among white evangelicals in the second half of the twentieth century. His article on colorblind ideology and white memories of the civil rights movement was recently published in History & Memory. Page last updated by CURE at 11:39 am November 10, 2017 . 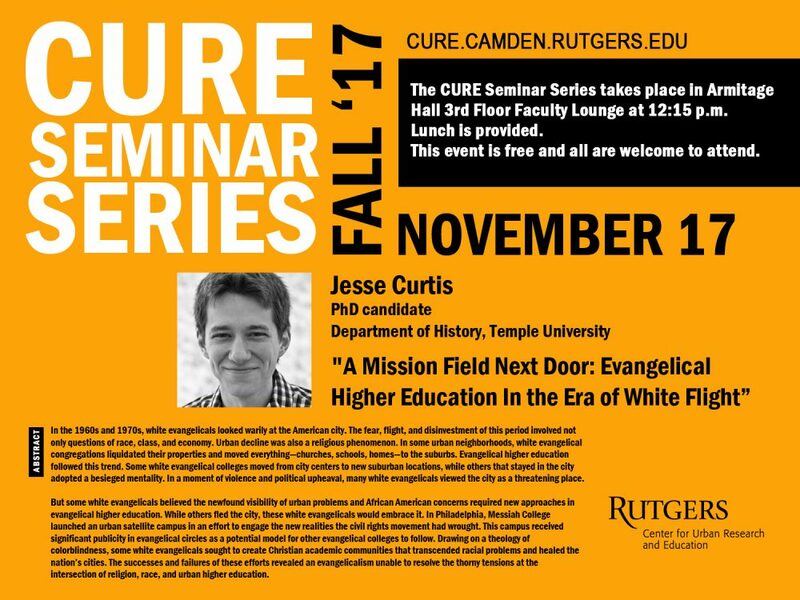 This page was printed from http://cure.camden.rutgers.edu/events/cure-seminar-series-a-mission-field-next-door-evangelical-higher-education-in-the-era-of-white-flight-with-jesse-curtis/ at 8:31 AM Saturday, April 20, 2019.